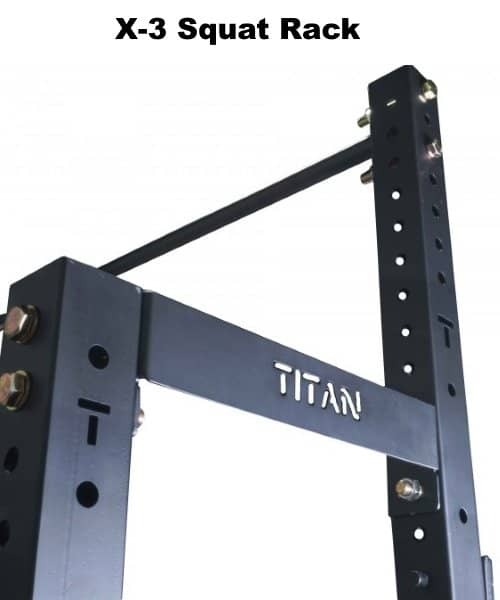 Titan X-3 Squat Stand and Half Rack Review: Which Is Best for You? 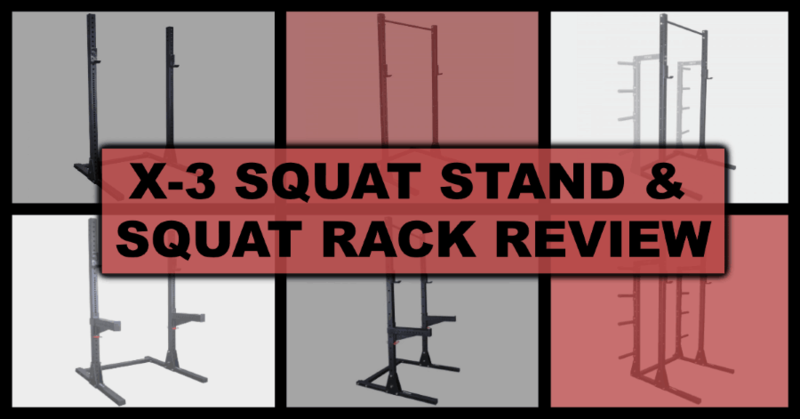 Home > Blog > Equipment > Titan X-3 Squat Stand and Half Rack Review: Which Is Best for You? In this Titan X-3 Squat Stand and Half Rack review, I'll discuss all of the Titan Fitness squat stands and racks listed in the table below. 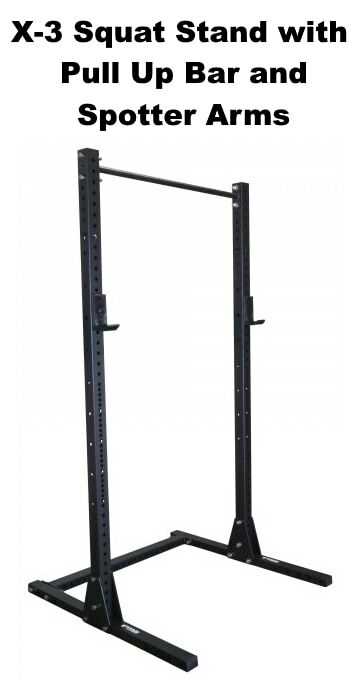 X-3 Half Rack (formerly called the "X-3 Squat Rack"
Ready to Buy an X-3 Squat Stand or Half Rack? Want to Get the X-3 Flat Foot Power Rack Instead? 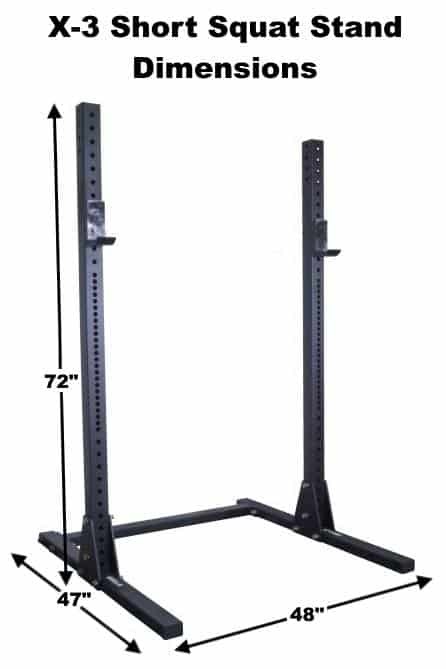 Same internal width of 42"
All X-3 Squat Stands and X-3 Half Rack are rated for a 1000 lbs weight capacity; whereas all X-3 power racks are rated for 1500 lbs. X-3 power racks have four uprights of the same height, connected at the top by steel tubing. Whereas, the X-3 Stands have just two uprights. The X-3 Half Rack does have four uprights, but they connect to the rest of the rack with just two metal strips and there is much less space (i.e. 17" vs 30") to move around in between the half rack uprights vs. the power rack uprights. Below, I'll discuss each of the different variations of the X-3 Squat Stand and X-3 Half Rack. 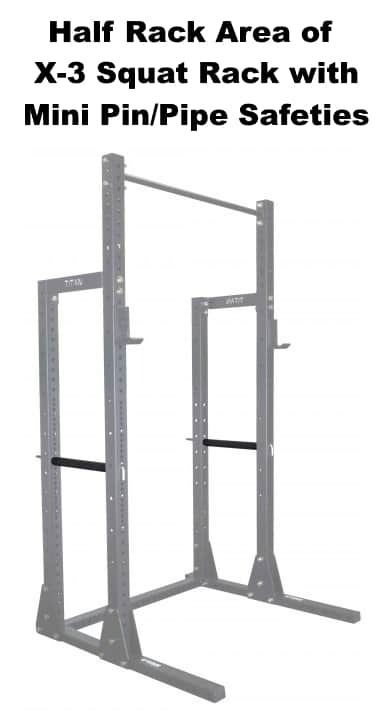 The short squat stand is the smallest and most minimalist rack in the X-3 lineup. It stands at just 72 inches, or 6 feet tall when fully assembled. This is a full 10.375" inches shorter than the X-3 short power rack, which has a height of 82.375" (or 6 ft 10.375 in). The X-3 short power rack will be short enough to fit in most people home gym areas. However, I'm sure there's a plenty of people out there who want the X-3 short power rack, but their ceiling is just a little too short. As I mentioned in my X-3 Short Power Rack review, if my basement's ceiling was just half an inch shorter, I wouldn't have been able to fit it in my basement--In such a case, I would've seriously considered the X-3 Short Squat Stand as an alternative. So the fact that there's 72" short squat stand variation of the X-3 That's very good news if your ceiling is so low that even the X-3 short power rack won't fit in it. This version of the X-3 Short Squat Stand is the most plain-Jane version of the X-3 short squat stands you can buy. You get just the stands (including the base connecting them) and a pair of j-hooks for racking your barbell. That's it. There's no pull up bar, so you can't connect the stands at the top. 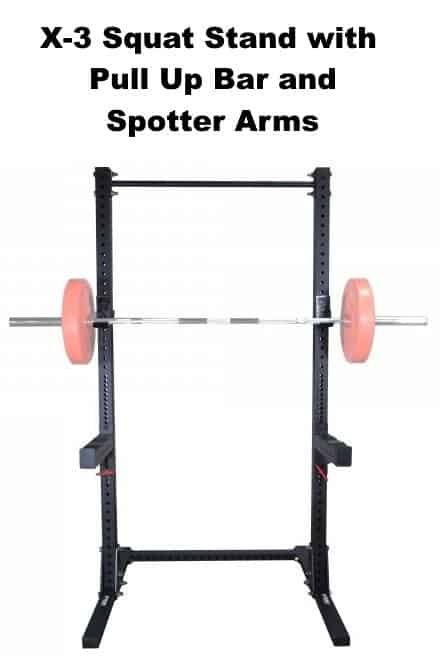 And it doesn't come with spotter arms either. So you shouldn't be trying to bench or squat with weights or reps that you may fail on. The exception to this is if you're into Olympic style lifting and are squatting with bumper plates so that you can easily dump the bar off your back if needed. All of the above might sound a bit negative. However, it's not a negative if all you really want is basic squat stand setup. Of course, there's a big positive to having such a minimalist set set up: It's very affordable! In fact, it is the least expensive of all the different X-3 rack configurations. As such, this may be the best choice if you're really on a tight budget. It even beats out the plain version of the full-height X-3 squat stands by a full $50. Also, it's important to realize that just because this version of the short squat stand doesn't come with spotter arms, it doesn't mean you can't buy them separately at a later date. Of course, there are also plenty of other compatible X-3 accessories that you can buy if and when needed in the future. So if you're very limited by budget, I'd recommend getting just this basic short squat stand. Then make due with it in the mean time. Then just save up again until you can afford spotter arms or whatever accessories and other gym equipment you may need the most. Over several months or years, you'll be able to build up an excellent home gym. Just be smart with your equipment choices and wait for sales to save extra. The X-3 Short Squat Stand with spotter arms included is the same as version #1 (described above), except that this version comes with a pair of spotter arms included. This means you can safely squat and bench with heavier weights, and push the limits more than would otherwise be safe. As mentioned above, it costs about $50 more than the version of the short stands without the spotter arms. However, it will save you almost $30 compared to if you bought the version of the short stands without the spotter arms and then bought the spotter arms separately later (they retail at $79 when sold separately). So, if you want the spotter arms and can afford the extra $50 now, then go with this version. 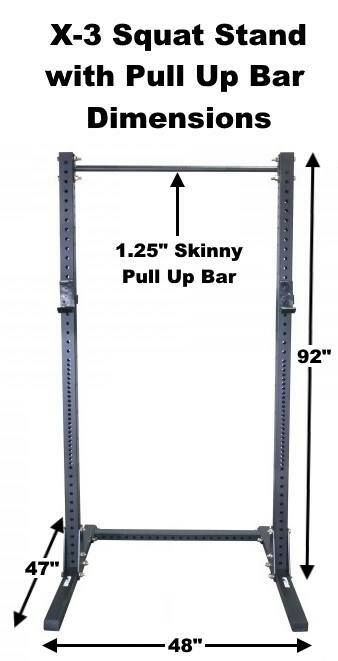 Buy a pull up bar separately and install at the top of the rack. This will provide greater stability, and of course allow you to do several pull up variations. 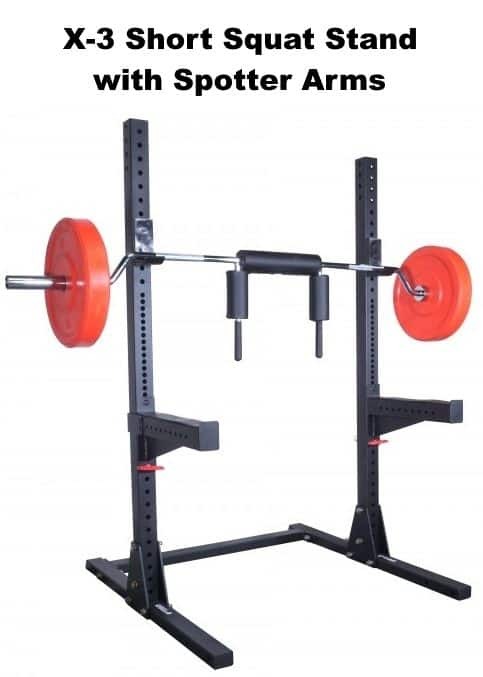 Buy the X-3 squat stand to half rack conversion kit to turn it into a half rack. This adds two uprights that are the same height as the short squat stand: 72". It creates a fully enclosed section between the 2 pairs of uprights. The small sections amounts to a mini-power rack that's 17" deep. That's not deep at all, but most people will be able to pull off squats and bench (and any number of other exercises) if they can stand being cramped. Beyond that, the second pair of uprights can also be used as a dedicated plate storage area thanks to the storage pegs that come standard. If you do both of the above customizations you'll have a short version of the X-3 Half Rack. While you can buy the tall version of the X-3 Half Rack pre-configured, you cannot do so for the short version (at least as of December 2017). So the only way to get the short version is to buy one of the X-3 short stands and then buy the conversion kit and pull up bar separately, as described above. Lastly, I want to reiterate the fact that you can further expand the utility of your short squat stand (or converted short half rack) by purchasing any of a number of different X-3 accessories. Please see my X-3 Accessory Compatibility Chart below for more details. This consists of just 2 uprights, connected by the flat foot base at the bottom and a 1.25" diameter skinny pull up bar at the top. It is a tall squat stand with a height of 92". The X-3 Squat Stand with Pull Up Bar is the most bare bones version of the full-height X-3 Squat Stand you can buy. It comes with just the rack, a pull up bar and a pair of j-hooks. It doesn't come with any spotters or other accessories. However, you can buy those separately. In fact, if you buy the X-3 spotter arms, then you have the same exact setup as version #2 (see below). The only reason I could see getting this one without spotter arms included, is if you have already have a pair of compatible spotter arms, or if you're on a strict budget and won't be able to buy the spotter arms until later. 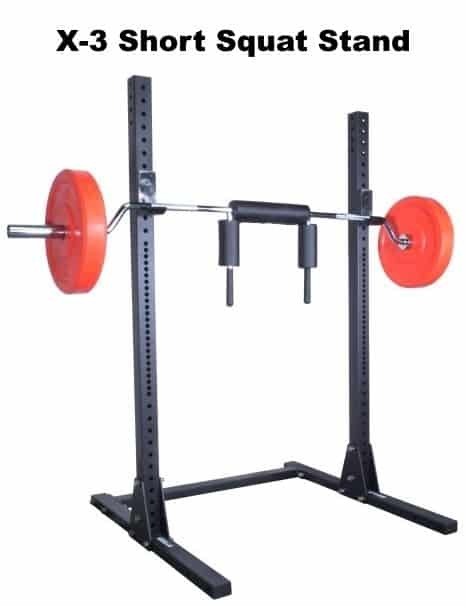 The X-3 Squat Stand with spotter arms, j-hooks and pull up bar is the exact same rack and setup as version #1 described above, except it comes with the spotter arms. 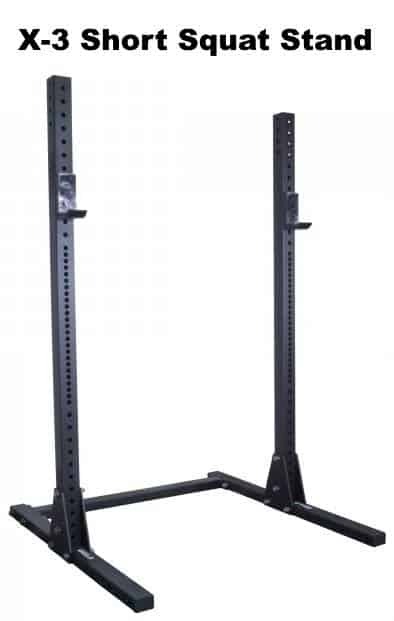 Convert it to an X-3 Half Rack with the X-3 squat stand to half rack conversion kit. 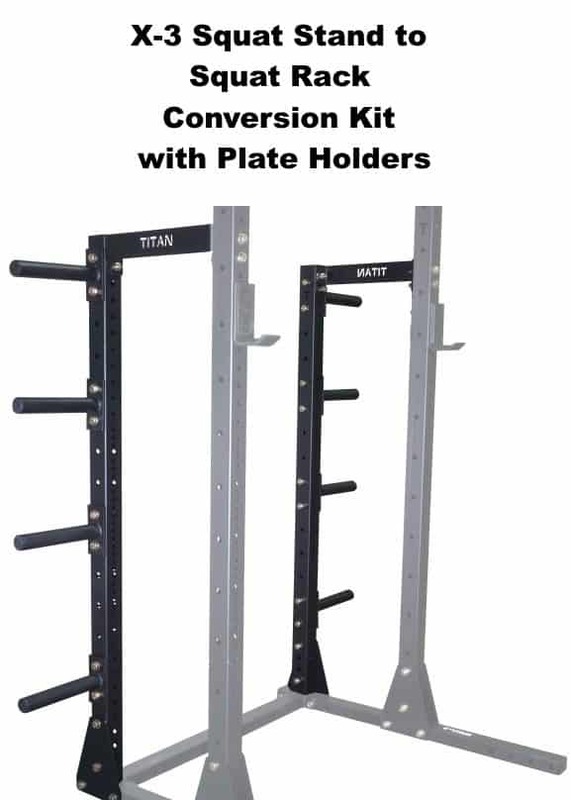 This conversion kit adds two 72" uprights, which are behind the squat stand's uprights and connected to them. This creates a mini-power rack section that's 17" deep. That's just enough room for most people to squat, bench and do many other exercises. The second pair of uprights can also be used to store weights, since it comes with weight plate storage pegs. NOTE: I'll discuss this conversion kit in further detail, below. Buy X-3 accessories to expand the stand's capabilities. There are several X-3 accessories that you can buy separately, that increase the number and variety of exercises you can do with the squat stand. However, not all X-3 accessories work with squat stand. Some only work for the X-3 Half Rack and/or X-3 Power Racks, so be sure to check out my X-3 Accessories Compatibility Chart here. This squat stand to half rack conversion kit adds a second pair of uprights to your squat stand, for a total of four uprights. It is compatible with both the X-3 Squat Stand or X-3 Short Squat Stand. The conversion kit uprights are 72" tall and connect to the main uprights as shown in the photos above. They also attach at the base of the squat stands, onto the flat feet. As such, it creates a fully enclosed area and what amounts to a mini-power rack in the back of the squat stand. This gives you a place to squat, bench, do RDLs, shrugs and more power rack exercises. However, it's important to understand that it'll have a depth of just 17" (most power racks have at least a 24" depth). So it may feel a bit more cramped than you'd prefer. But, you can make due. If you're getting this for your squat stand, it's probably because you're short on space to begin with. 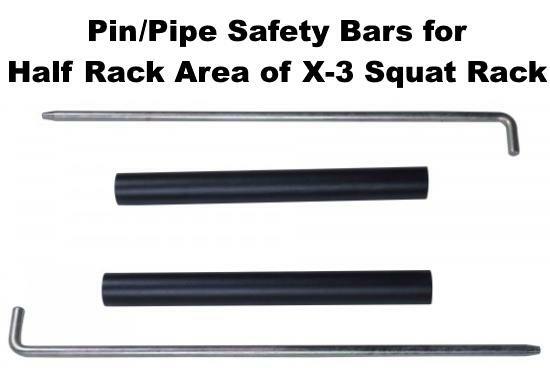 NOTE: If you want to do the above-mentioned exercises in this mini-rack area, you'll want to buy the X-3 Half Rack Pin Pipe Safeties separately for ~$30. They are not included with the conversion kit. The kit also comes with 8 weight storage pegs meant for use on this second pair of uprights. This way, you can store all your weights on the back section, away from the front of the rack, where you'll be doing the majority of you work. 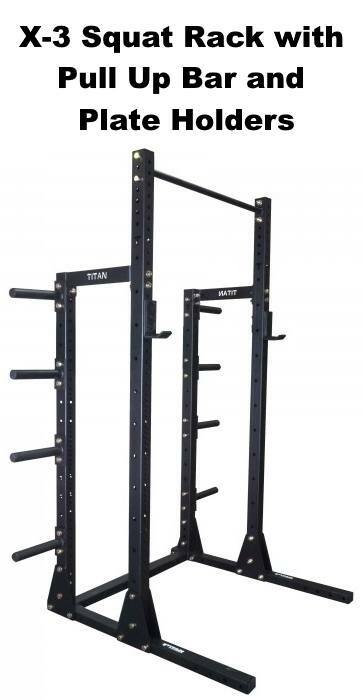 I mentioned and briefly discussed the Titan X-3 Half Rack above, when talking about the X-3 squat stands. To summarize, my main point was that you can build the X-3 Half Rack over time if you start with just an X-3 Squat Stand. 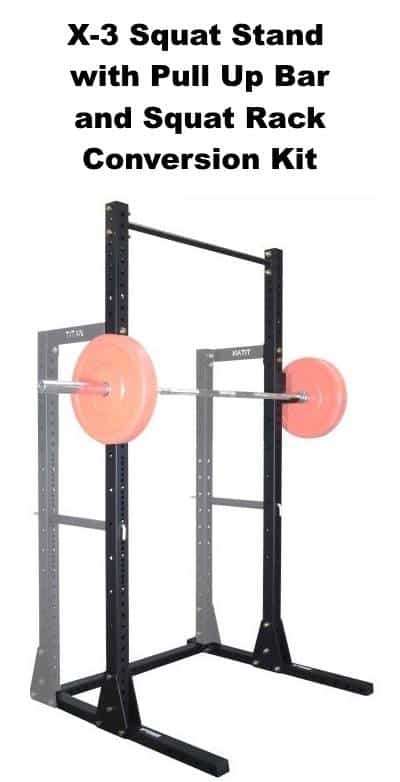 NOTE / UPDATE: The X-3 Half Rack was originally called the "X-3 Squat Rack" when I first wrote this review. This was a misnomer. It's May 2018 as I'm updating this and Titan has corrected it sometime between now and when I originally published this page. 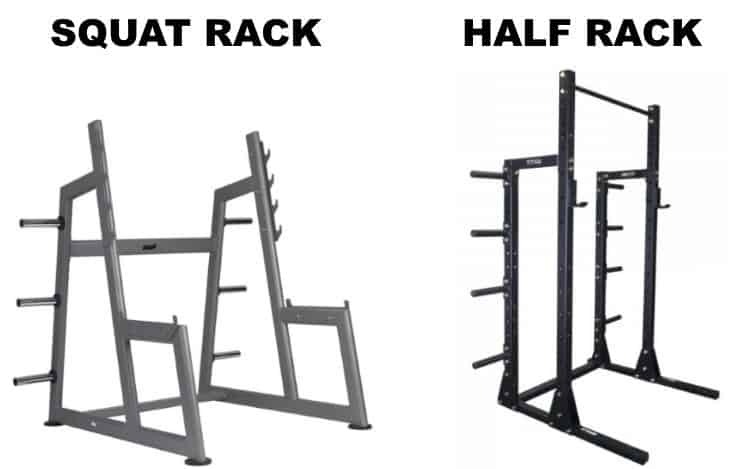 For anyone who doesn't already know, a "squat rack" often refers to the type of rack shown in the image below (on left). Or it can be used ambiguously to describe any type of rack that you could squat in, from a power rack to squat stands and anything in between. It's subtle distinction, but worth clarifying, since "half rack" is a meaningful term that accurately describes what this is. Hence, why Titan updated the name for accuracy. One more point to add: the X-3 Half Rack actually has one big difference compared to most other half racks: The rear section can be used as a mini-power rack area for exercises., complete with safety spotters. So, what exactly is the X-3 Half Rack? I like to describe it like this: It's a squat stand in the front and a mini-power rack in the back. It comes with a pull up bar on the squat stand section on the front of the rack. This adds stability to the entire half rack and lets you do pull ups (duh!). The rear section that forms the mini-power rack area is only 17" deep. The narrowest of a full size power rack is usually 24" deep, which itself is not exactly spacious. So just 17" is going to be quite cramped. However, it is enough room for most people to do most power rack exercises. You'll have to take extra care to move the bar and your body more precisely so as to avoid bumping into the uprights. This is a necessary trade-off for having all the benefits of a squat stand PLUS many of the benefits of a power rack while having a lower price point, while taking up less space thanks to the open front section and costing less than the X-3 power racks (by ~$55 vs X-3 short power rack or ~$75 for the full-height X-3 power rack). It does NOT come with the X-3 Half Rack Pin Pipe Safeties. These are necessary to use the rear section like a power rack. These are the same as regular pin/pipe safeties for the X-3 power racks, described earlier. They're the same except for the obvious difference in length. Unfortunately, these half rack safeties aren't included with the conversion kit. That said, they're only ~$30. That price tag is really just a drop in the bucket considering how much functionality they add to the setup. It does NOT come with the X-3 spotter arms. These are necessary if you want to be able to safely bench or squat in the front section of the rack. Not to mention, they're highly convenient if not totally necessary to do many number of other exercises in the front of the rack (e.g. rack pulls, z-press, pin press; racking the bar between sets on rows, shrugs and curls). I consider this a must-have for this set up. It's about $80. If you can't afford when you buy the half rack, you can always buy it later. Overall, this is a great rack. It certainly beats out having just a squat stand in terms of durability and functionality. However, the X-3 power racks are superior in my opinion. 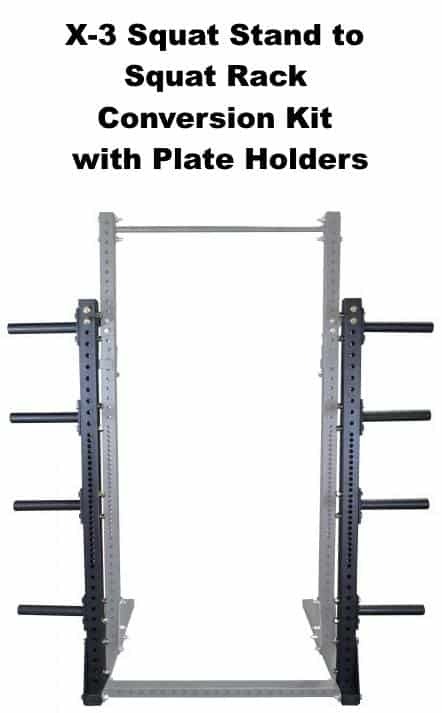 This is because the power racks have even greater weight capacity (1500 lbs vs 1000 lbs weight capacity) and have plenty of space inside the rack compared to the mini-power rack section of the half rack (30" vs 17" depth) that allow for greater safety, comfort and exercise selection when working inside the rack. Plus, there's more accessories available for the X-3 power racks than the X-3 half rack. If the X-3 Half Rack is meets your needs and you don't want to spend any more money than necessary. You'll save about $55 (vs the X-3 Short Power Rack) or $75 (vs the full-height X-3 Flat Foot Power Rack). That said, don't forget to factor in the cost of any accessories you may want--I know I would basically need the ~$30 half-rack pin/pipe safeties and the ~$80 spotter arms if I went with the X-3 half rack. This would actually make it more expensive than either of X-3 Flat Foot Rower Rack options. 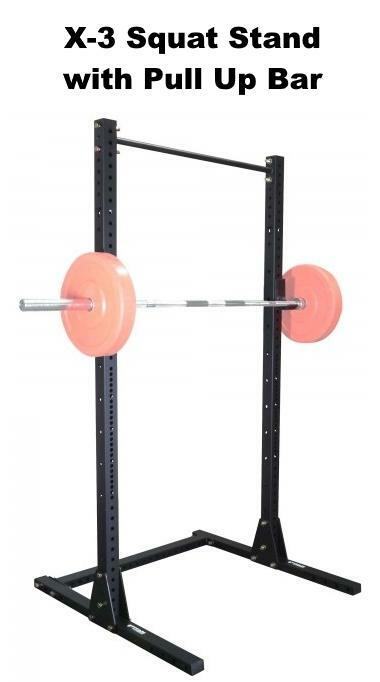 Not all X-3 accessories are compatible with the X-3 Squat Stands and Half Racks. Some only work with the X-3 Power Racks. Whereas, others work for only the X-3 Squat Stands and/or Half Racks, but not the X-3 Power Racks. NOTE: Some accessories may technically fit on one type of rack, yet may not be recommended for safety or practical reasons (e.g. band pegs don't make sense on a squat stand). In such cases, I have simply mark them with an 'X' for incompatible. I hope I was able to help you figure out which X-3 setup is best for you. Below, I'll list out the product page links all of the different squat stand and half rack configurations. Here are the links to all the different squat stand configurations. Do you know if they plan on adding a lat/row attachment for the X-3 flat foot? They already have this lat / triceps pulldown attachment that works with the X-3 flat foot rack. There’s also a low row attachment for the sumo base X-3 racks, but it’s not compatible with the flat foot version. Lastly, there’s the option of rack-mounted / wall-mounted pulley system that’s compatible with the X-3 flat foot rack (see also the short version). These give you access to high pulley exercises, low pulley and anything in between — the price is quite competitive, too.